Owen Strickland Magic in Top 10 UK Blog sites! Owen Strickland Magic in Top 10 UK Blog sites!! Owen Strickland Magic in Top 10 UK Blog sites!! I just had a few days R&R In Spain with some friends before this weekends Weddings. 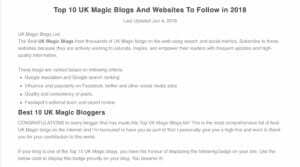 Whilst there I was delighted to get an email from Anuj Agarwal at https://blog.feedspot.com/uk_magic_blogs/ to say my Blog is in the top 10 Magic Blogs in the UK! I was thrilled about this and it was a very pleasant surprise. I don’t consider myself an expert in any way shape or from, but what I do try and do is keep anyone coming to the site up to date in what Weddings and events I am performing at. For me, it gives peace of mind that visitors to the site who are looking for a magician, can see how many events I do. There are so many magicians who state they’re are constantly busy, and may well be? However there Website and Social Media suggest that the opposite os the case. I truly believe that prospective clients can see all the events I do as they then have peace of mind they are getting genuinely a busy magician. Similary they can go to my gallery and see evidence of the 70-80 Weddings I perform at every year. https://owenstrickland.co.uk/wp-content/uploads/2018/06/Top-10-UK-Magic-Blogs-And-Websites-To-Follow-in-2018-2018-06-08-21-03-14.jpg 360 1023 Owen https://owenstrickland.co.uk/wp-content/uploads/2017/02/birmingham-magician-logo.png Owen2018-06-08 21:10:562018-06-08 21:10:56Owen Strickland Magic in Top 10 UK Blog sites! !